And why is that so earth shattering, you may ask? Because for 7, going on 8, years I have made my quilts up or altered the original source so thoroughly it was unrecognizable. However, when I came across Victoria Findlay Wolfe’s Cascade quilt in her newest book, “Modern Quilt Magic,” I knew I’d have to follow the directions to have my version work. I cut out the templates from plastic, hauled out my purple and its buddies scrap bin, traced the templates, and started cutting. There is lots of bias in each piece, so gentle handling is the key. As Victoria says, you need only pin in three places before sewing the units together. It also helps to match the registration marks piece to piece, and to mark them to begin with, of course. When I got to the light fabrics area I had to break into stash, which of course generates more scraps, and explains why scrap bins never get emptied. My version of Cascade, which I’m calling Church Windows per my husband’s comment, is smaller than Victoria’s. There is a limit to my purple fabrics. I don’t know if I’ll quilt this one myself or send it out. It’s quite bias-y though I’ve stay stitched all the edges. “Modern Quilt Magic” focuses on partial and set in seams projects, and gives thorough explanations of the processes. You can see a video of some of the techniques here. I appreciated the line drawings of the quilts that you can try out colors on before cutting up your fabric. I wonder what this pattern would look like in horizontal stripes or diagonal colors? I’d better break out my colored pencils. Every blog reaches the point where it needs some new drapes and slipcovers as the old have gotten a bit shabby. I’ve begun that process here by deleting one feature – books about quilting that I like, and adding another – quilts I’ve made by type. I own lots of books about quilting, even after giving away many of my books about traditional quilts and patterns. I make a point of looking at quilting books as they’re published, mostly by borrowing them from my library. 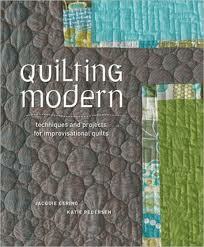 However, I think that fewer books about quilting are being published, and that trend will continue. AQS will no longer publish new books, and I’ve noticed fewer titles on offer from other publishers. Some of the books that do get published, many focused on modern quilting and craft sewing, strike me as lean on content. The availability of digital patterns and loads of free stuff on the internet, especially YouTube videos of techniques, make it so easy to do without books. Then, there are online classes from Craftsy, creativebug, and others. Of course, the classes impact the quantity of in-person teaching available, as well. The upshot is I realized I hadn’t added any books to that section of this blog in a few years and very few readers looked at it, so I felt it was time to retire it. You can still read reviews I’ve written by clicking on “books” under Topics. I plan to continue reviewing books of potential interest to me and my readers. Now to the addition. When I began this blog I grouped photos of my quilts by years. Recently I thought about what types of quilts I’ve made over the years, and decided to sort my quilts by type. Turns out the majority are improvisational and graphic. Of course, my categories are a bit arbitrary as some quilts could fit more than one type. And another person would sort them differently. I’ve kept the rest of the pages, including tutorials. I like to have tutorials I use a lot in one place. From my site’s stats it seems many people look at that page. Every so often I check to make sure the links still work, so I hope there’s not much link rot. I’d love to hear your opinions as to what parts of this blog are helpful and/or interesting. Since I began it as a journal of my quilting experiences, I don’t cover topics I don’t care about, and it is indeed all about me and my opinions. I’ve made it public in hopes that others might learn from my experiences, especially from my goofs. One great, unanticipated, result of making my thoughts public is meeting my readers through their comments. Many thanks. Over the past few weeks I’ve been devouring two new books on modern quilting, specifically “Quilting Modern” and “Modern Patchwork.” I own the former, thanks to a gift, and have borrowed the latter from the library. These books are modern in more than their sensibility. All the authors started as bloggers and developed followings as they honed their quilting skills and designs. Also, the books have been marketed online through a network of quilting blogs, another modern touch. No, the SQ was not one of those blogs. To cut to the chase, both books offer quilters good introductions to modern quilting. They give lots of quilt patterns, plus instructions on the mechanics of quilt construction. “Quilting Modern” presents more individual techniques that can be used in other quilts, stresses improvisation, and has 21 projects. “Modern Patchwork” presents 12 specific quilt patterns that contain techniques you could use differently, but that aspect isn’t stressed. The latter is directed at intermediate quilters who are ready for more than wonky log cabins, but want to make stylish quilts that fit in a more modern home. I’m paraphrasing the author. Given that statement, I guess you can figure out which book the SQ prefers. 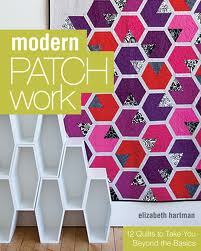 However, for many quilters “Modern Patchwork” will provide unusual, pleasantly challenging sewing possibilities. And that’s not a bad thing.